Last page on its back has FULL HAND WRITTEN NOTES by the creator of the show. IN STOCK & READY TO SHIP - USA SELLER - OUR LAST ONE!! 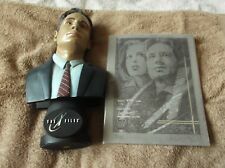 X-Files "SPECIAL AGENT FOX MULDER" Limited Edition Bust + more! - LOOK!!! MOST OFTEN THE DARKER THE PHOTO IS MOST DESCRIPTIVE OF THE ITEM COLOR. SLIGHTLY USED CONDITION. 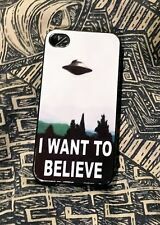 This is an iPhone case for fourth generation iPhone with "I Want to Believe" on it. Minimal use, in great condition. 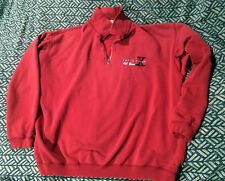 It's a fourth season X-Files crew sweatshirt. Wear it around the house while you're reliving The X-Files! Aliens are a favorite of earthlings, Sci-Fi fans and Trekkie collectors alike!Note: Second alien in last photo is a prop order only includes 1 (one) alien statue. UFO Space Alien Skull Skeleton Sculpture Statue Halloween Prop Extra Terrestrial. MOST OFTEN THE DARKER THE PHOTO IS MOST DESCRIPTIVE OF THE ITEM COLOR. HUNDREDS OF BOOKS, FANTASTIC FASHIONS AND COLLECTIBLES. Low, low prices! Here you will find a great selection of popular titles from the 1980's to present at. Whether you buy 1 comic, 10 comics, 100 comics,etc. This item is new and is in perfect condition. Color is a vibrant red and is made of hard plastic. Width of face is 4 3/4". The photos show detail. X-Files - Review of first two seasons and look forward to Season 3 Exclusive photos of David Duchovny and Gillian Anderson. RARE VHS TAPES THAT I BOUGHT AT COLLECTIBLE SHOWS. THEY ARE FOR THAT PURPOSE ONLY. THEY WERE MADE BY A COLLECTOR, FOR A COLLECTOR. THIS INCLUDES 2 RARITY TAPES, A BLOOPER TAPE, A BEHIND THE SCENES THAT ONLY AIRED IN THE SAN FRANCISCO AREA (1HR 45 MIN), ELECTRONIC PRESS KIT AND A PERSONALITY VIDEO EACH OF GILLIAN ANDERSON AND DAVID DUCHOVNY. X-FILES - AUTOGRAPHED SCRIPT BY CHRIS CARTER - Gillian Anderson Benefit Charity! New never played with, however, the seal is broken. In original box. Lot Of X-Files Magazines. 22 magazines total. Set of 7 new bumper stickers. Here you will find a great selection of popular titles from the 1980's to present at. low, low prices! Mulder is carrying a torch accessory. This is for the sale of an X-files Statue. A Great chance to pick up this McFarlane Toys Cult TV X FILES ALIEN tv movie 6" creature. A must have for the X Files Fan! Includes 1. X-Files official magazine March 2002 with Annabeth Gish and Robert Patrick on cover; 5. Wizard comic 1/2 -- a limited edition comic from Wizard with certificate of authenticity; 6. Official 1996 X-Files calendar; 7. Nice addition to any collection and suitable for framing. Size large. Shirt is gem, no flaws, stains, tears -- it's been washed but not worn and tucked away for years. Here is a great movie magazine. You get X-Files the Movie, based on the Feature Film. THE X-FILES DEN OF GEEK 2017 NYCC EXCLUSIVE MAGAZINE New York Comic Con B&B. Condition is New Bagged & boarded since the convention but they were handed out with imperfections.  WILL BE BAGGED AND BOARDED SHIPPED SECURELY AND QUICKLY IN A CARDBOARD COMIC BOOK MAILER WITH BUBBLE WRAP WITH THE COLLECTOR IN MIND!! STARRING : DAVID DUCHOVNY AS FOX MULDER & GILLIAN ANDERSON AS DANA SCULLY. APRX : 24" X 36". AUSLÄNDISCHER KOPF. Dieser Pin kennzeichnet einen außerirdischen Kopf. X-Files ist eine lange laufende Sci-Fi-Verschwörungs-Show dreht sich sind Special Agent Mulder und Special Agent Scully, als sie die Geheimnisse entdecken, von denen die Regierung das Wissen ablehnt. Captured in a dramatic yet mysterious pose, the alien will be presented on a sculptural original X-Files base like the previous statue releases. HUNDREDS OF BOOKS, FANTASTIC FASHIONS AND COLLECTIBLES. MOST OFTEN THE DARKER THE PHOTO IS MOST DESCRIPTIVE OF THE ITEM COLOR.